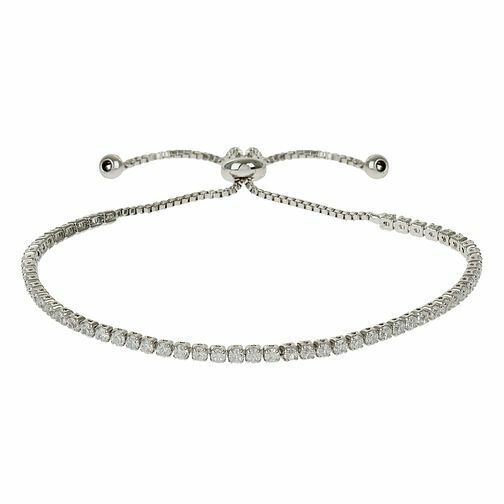 Designed to sparkle all day long, this glittering crystal set bolo bracelet by Mikey is perfect for layering with other bracelets for a statement look. London based jewellery designer Mikey specialises in unique, wearable glamour for all occasions. Mikey Silver Tone Crystal Chain Adjustable Bracelet is rated 4.7 out of 5 by 3. Rated 4 out of 5 by Anonymous from This product is an elegant timeless piece for women. This adjustable chain bracelet is highly commendable as it is self adjusting and the links have no way of breaking. It is a stunning set with the crystals perfect for a minimal touch. The overall design of the bracelet looks luxurious and suits any wrist!